Photos from the scene of the Overland aircraft that caught fire at Lagos Airport - SWANKYLOADED OFFICIAL BLOG. An aircraft belonging to Overland Airways caught fire at one of the General Aviation Terminal (GAT) hangars of the Murtala Muhammed Airport, Lagos today. Thankfully no life was injured or lost. 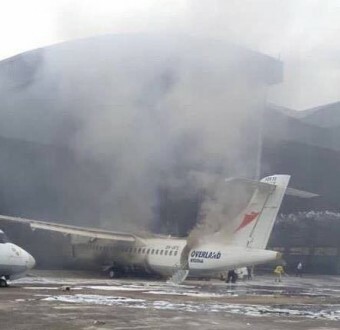 The aircraft caught fire while it was connected to the Group Ground Power Unit (GPU) of the Airport, destroying the millions of dollars worth equipment.